Join happy guests for a rich experience! 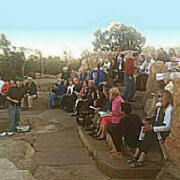 Our South Rim tours include exciting presentations at viewpoints, with visual aids and take-home surprises. Want to be safe, have fun, and learn a ton? In the past 15 years, our 30,000 guests have enjoyed and learned so much! 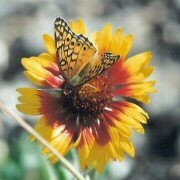 Come face to face with geology, wildlife, and Native American heritage. 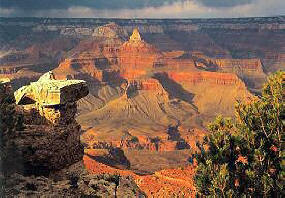 Our Ultimate Tour offers brilliant viewpoints and educational opportunities at the world's most stunning canyon. 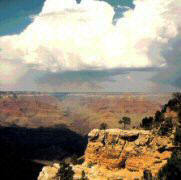 Visit every must-see viewpoint along the South Rim. We are the only tour that includes a sit-down introduction to the fascinating geology. It is our hallmark presentation, both educational and entertaining. The astounding sweep of geologic time is majestic, more even than you realized. Together, we will attempt to imagine it. Next we're off for a special restaurant lunch (included), followed by visits to viewpoints east. Our final viewpoints include the evening's beautiful shadows and the best chance to see wildlife. Take this tour from any nearby town or hotel. 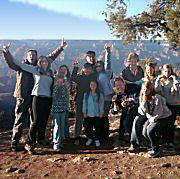 Our fully escorted Grand Canyon all day tours pick up in Flagstaff, Williams, Tusayan and the Grand Canyon itself. Here is the essence: we specialize in good times, splendid viewpoints, and entertaining education. You get an in-depth look into the natural science behind the scenes. You take home a thorough knowledge of where you've been and what it looked like. You won't forget your viewpoints and ours, and you won't feel that you've missed something and have to come again (unless you want to). Isn't this how you travel? We Are Proud of Our Reviews on Trip Advisor and Yelp! These cartoons tell how we differ from other tours. The Geology Presentation was the best talk they had ever heard on a tour.